This new performance yacht design is based on the latest trends in performance cruising yacht building and is the evolution of several victorious racing yacht designs. The sleek and powerful hull lines, high aspect ratio keel and the efficient low drag rudder are the warranty for a stable yacht that sails extremely high upwind and performs like an IMS racing yacht. The hull and deck are moulded under the designer's supervision in controlled environment conditions. All laminating is carried out by hand to high standard. Hull and deck are of sandwich construction. For hull unidirectional Kevlar, E-glass, PVC foam core and vinyl ester resin is used. Deck is of biaxial E-glass, PVC foam core and polyester resin. Cast iron keel faired and finished in gelcoat is bolted on reinforced hull with S/S bolts. Diesel engine Volvo Penta MD2030, 21kW/29HP, 3 -cylinder is provided as standard. It is mounted on three rubber feet on strong foundations to avoid vibration and noise. Control panel with alarm gauges for low oil pressure, water temperature, tachometer and hour meter. Two bladed propeller is connected to the engine via sail drive transmission. 85 liters fuel stainless steel tank is installed under the berth. Engine monolever control in cockpit. Separate 12 Volt circuit for engine start and general use are served by two heavy duty 85 Ah battery. Third battery as an option. Charging of the batteries from the engine is via 60 Amp alternator. All electrics are connected to appropriately sized circuit breakers on electrical panel located near chart table. Main battery switches are under the companionway. Lighting throughout the boat is located in all important positions and international navigation lights are provided. Water supply is from two plastic tanks with a capacity of approximately 250 liters. Deep galley sink with drain and manual pump for freshwater and 3-flame gas cooker with stove are mounted in L-shaped galley. Marine toilet and washbasin are in toilet compartment. Manual bilge pump with lever in the cockpit, electric bilge pump is located in the engine compartment. Selden fractional tapered aluminum deck-stepped mast with two back swept spreaders. Aluminum boom with 1:16 vang. Discontinuous standing rigging with 1:32 backstay adjuster, furling jib as an option. Spi-pole may be optionally installed. Main halyard, 2x jib/gen/spi halyard, gen/spi top halyard, main outhaul, 2x reef line, main sheet, 2x genoa sheet and optional 2x gennaker/spinnaker sheet. Performance sandwich or mylar-kevlar jib and mainsail and nylon gennaker or spinaker from renowned sailmaker may be delivered. Furlex furling jib as an option. Twin steering positions of ergonomic design are fitted with wheel steering systems. Stainless steel solid rudder stock with self-aligning bearings ensures safety. High aspect ratio rudder blade is made of unidirectional E-glass and vinyl ester. Exterior finish is of light gray/white gelcoat with elegant color stripes. Structural liner is finished in white gelcoat. Varnished best quality marine plywood is used for the bulkheads and furniture. 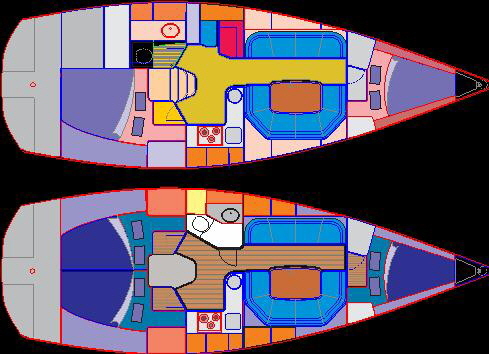 Huge hull interior with full headroom is generously provided with portlights and hatches to ensure optimal ventilation and illumination. According to the owners needs there is a two or a three double cabin layout option to chose. There are XL berths, large lockers, plenty of stovage room, large saloon with U-shaped dinette , navigation table with lockers, toilet compartment with shower and wet locker and a complete ergonomic galley in both versions. inovativne rešitve v navtiki, d.o.o.